As if yesterday wasn't a good enough day for food, today just elevated things to a new place altogether. Last night at Artz, a couple of friends asked if I wanted to join them today for brunch at Fino. Let me think about that for a minute, uh YEAH! For one, I LOVE brunch, and hardly ever get to go out for it because I usually work on weekends. And second, these friends are the mother and aunt of the chef at Fino, and I knew this would be an eating affair to remember. None of us were disappointed. Just fatter and happier than from when we arrived. Fino has occupied the space of the former Granite Cafe for almost 3 years; it's owned by Lisa & Emmett Fox, both exceptional chefs in their own right. 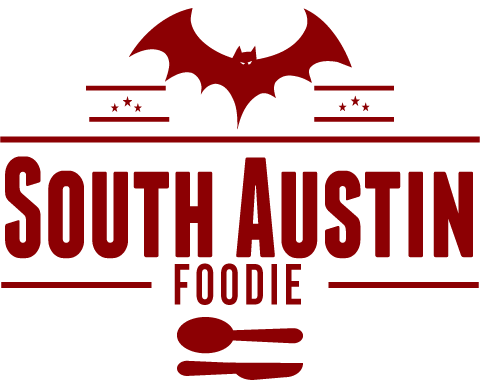 The focus is various influences of Mediterranean food, with much of the menu small plates designed for sharing. It's the sister restaurant to Asti, their Italian eatery in Hyde Park. 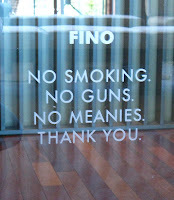 Fino has never been open on Sundays, until now. Today's brunch was invite only, evidently a final test run before really being open to the general public. The Foxes were gracious hosts today, coming to chat with the friends and family of their staff members, as Executive Chef Jason Donoho (who they plucked from Asti about a year ago, and the son/nephew of my friends) ran the kitchen. We began with cocktails on the lovely patio. I had sangria, and everyone else bloody marys, oh and one vodka; everybody was quite happy with their choices. 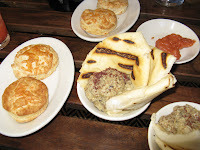 For starters, we had the manchego biscuits with quice jam, and what could probably be called a baba ganoush, with pita. The biscuits were good, and had melted manchego on top (as opposed to inside them, as far as I could tell), but weren't quite as light and flaky as they could be (yes, I am particular about my biscuits!). The quince jam however, was out of this world. Chef Jason told us later that all it is is the fruit and a bit of sugar. It was creamy, almost like a fruit butter. The baba ganoush had a really nice charred/grilled eggplant flavor, and a lovely soft house-made pita bread. The main brunch courses were: eggs benedict w/jamon serrano & truffled hollandaise; scrambled eggs with house-cured salmon; wagyu steak with a fried egg; pan perdido (French toast) with vanilla mascarpone, orange blossom syrup & chopped marcona almonds; crab & avocado bocadillo (sandwich)w/lemon aioli; & asparagus omelette with truffle oil & goat cheese. Along with some additional sides of sweet corn grits, applewood smoked bacon, house-made chorizo sausage, & potato hash with paprika. Chef Jason has really lifted things to a whole new level at Fino. 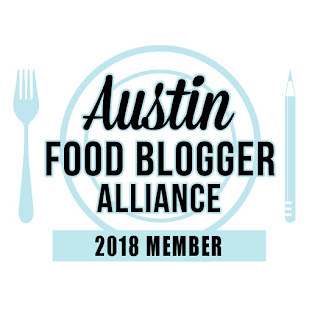 He tries to find as much locally sourced foods as possible, such as the eggs (Alexander Farms) & greens (Bella Verde Farms) and told us for next week, he will be curing a side of pork to make his own bacon, and making his own tabasco-style sauce, all certainly worth coming back for. The seven of us pretty much ooohed & aaahed, and moaned & groaned with glee & giddyness through the entire meal. Everything was refined and delicious, but a couple items really stood out: the sweet corn grits, the French toast, the omelette, and probably the Benedict were exceptional. (I think the Benedict was the one thing I didn't try as I have an aversion to poached eggs.) The grits were like nothing I have ever had. Chef Jason said they were a combo of Anson Mills polenta (a South Carolina mill specializing in heirloom grains) pureed with fresh corn with butter, cream, and honey, I believe. French toast does me in every time, and for this dish, French bread was soaked overnight in eggs, milk & vanilla. Then grilled, and served with this fat dollop of vanilla mascarpone.... and of course I ate mine with bacon. Out of everything we sampled today (and we had almost the entire menu), I think the only thing that I really didn't just love was the house-made chorizo sausage; it was a fresh (as in not dried) sausage in a casing. To me, it didn't have the depth of seasoning that I expect in a chorizo, whether fresh or a typical Spanish-style dried. I haven't even really talked about the other cocktails. Sangria and Bloody Mary's got us going. Along the way were a Cava Mimosa, a Corpse Reviver, and a couple Spanish Black Coffees, all fabulous concoctions, surely made by Fino's famous mixologist Bill Norris. (Check their website for cocktail descriptions!). And then there was dessert. 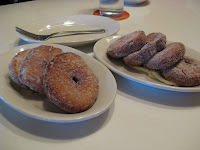 Melt in your mouth, warm cake donuts with cinnamon sugar, and also served with the heavenly vanilla mascarpone. This has really been one of the best all-around complete meals I have had in a long time. It was a treat to have the Chef's attention, not to mention his food. For 7 food-loving people, we were all happy to share all the dishes, dip our fingers into the sauces, and pass cocktails so we could all imbibe a bit of something special. And everything WAS special. As we were reclining on the patio after the meal, we noticed the sign etched into their door: no meanies allowed! Says it all, don't you think?